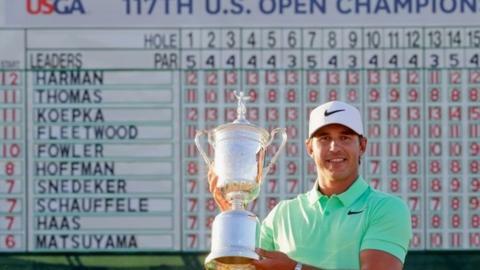 American Brooks Koepka equalled the US Open's lowest winning score of 16 under to claim his first major at Erin Hills. England's Tommy Fleetwood, shot a level-par 72 to end fourth on 11 under. The pair started Sunday's final round one off the lead but Koepka holed three birdies in his first eight holes, while Fleetwood followed a birdie on the second with three bogeys in his next six holes for a five-shot swing. Fleetwood, ranked 33rd in the world, steadied his round with a birdie on the ninth and returned to 11 under by picking up another shot on the par-five 14th and then parred his final four holes. "I didn't play how I wanted to," he said on Sky Sports. "You never know how you're going to react being up there in the final round - you've got to deal with that and it's all new for me." However, he was quick to praise Koepka who becomes the seventh first-time major winner in succession. "He was brilliant, the shots he hit down the stretch, you can't describe how hard some of them are," Fleetwood continued. "He was phenomenal - I would've like to have played like that. It was windy and he shot five under, fair play." How did Koepka win the title? BBC Radio 5 live's Jay Townsend said in commentary that Koepka only seriously got into golf after being involved in a car accident at the age of 10. Townsend added: "As a result, he was banned from playing contact sports and that's how he seriously got into golf. It was kind of by accident." The 27-year-old from Florida who turned professional in 2012, had won twice on the European Tour and just once on the PGA Tour before this win, which earns him $2.1m (£1.6m). Koepka opened his final round in perfect fashion with birdies on his opening two holes. Another followed on the eighth and he battled hard after dropping a shot on the 10th, holing a 10-foot par-putt on the 13th before effectively winning the title with his birdie streak from the 14th. The statistics show that he won with a combination of power and accuracy from tee to green on the 7,845-yard course, the longest in major championship history. The fairways were the widest in US Open history and Koepka took full advantage, averaging 307 yards off the tee and hitting 88% of them across the four rounds, tied fourth overall. "It was bombs away," he said. "You could hit it far and the fairways were generous enough. That was a big plus for me. I'm a big ball striker. On some of these par fives I don't even need to hit driver to get there." Staying on the fairways and out of the punishing thigh-deep fescue rough helped Koepka hit the most greens in regulation, 62 out of 72. Once on the greens Koepka said he "putted brilliantly", although he took 1.71 putts per hole, slightly above the average for the field. On joining the likes of Arnold Palmer, Jack Nicklaus and Tiger Woods as a US Open winner, he added: "To be in the same category as some of the guys on this trophy is unbelievable. This is truly special, it really is." What of the world's best? The only men in the world's top 10 to significantly challenge a leaderboard dominated by players chasing their first victory at a major were Matsuyama and American Rickie Fowler and both of them are also yet to win one of golf's big four prizes. World number four Matsuyama started six shots behind Harman and began positively with with three birdies in five holes. However, despite five more on the back nine, two bogeys proved costly. Fowler started two back but the world number nine did not threaten the lead at any point and carded a 72 - including dropped shots at the 12th and 15th - to finish on 10 under par. The 28-year-old ended tied for fifth with fellow Americans Bill Haas and Xander Schauffele and was satisfied with a seventh top-10 finish at a major. "If you look at the negatives too much, you're going to be stuck doing that the whole time," he reasoned. "You have to measure success in different ways, not just by winning, just because that doesn't happen a whole lot. You kind of have to say, 'Hey, it's a major.'" American Jordan Spieth, winner in 2015, closed with a three-under 69 to finish on one over. The 22-year-old, ranked fifth, was pleased with his tee-to-green play but conceded he was "not comfortable" on the greens all week and has "work to do with the putter". Masters champion Sergio Garcia is world number seven and the Spaniard had a solid, if unspectacular, week in Wisconsin. A two-under 70, followed by two 71s and a 72 returned a four under par total. Eddie Pepperell was the only one of the six other Britons to make the cut to finish the day better than he started it. The 26-year-old, playing in his second US Open, carded a one-under 71 to improve to five under. Paul Casey, who was in a four-way tie for the lead at halfway on seven under par, saw his challenge effectively end with a three-over 75 on Saturday. A quiet finish with just the two bogeys saw the 39-year-old end on two under. Scotland's Martin Laird also went backwards, closing with a 73 to finish the tournament as he started, on level par. Matt Fitzpatrick of England was next best on one over after posting a four-over 76 that featured six bogeys, one double bogey and four birdies. Compatriot Andrew Johnston dropped five shots in five holes on his front nine but rallied with a couple of birdies on the back nine as he closed with a three-over 75 and two over total. Lee Westwood finished his 18th US Open with a four-over 76 to end on seven over.